Produced by Ghosts Media Inc. 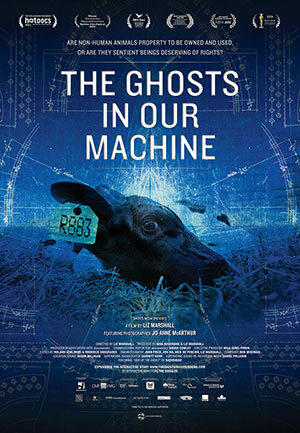 The Ghosts In Our Machine is a cross-platform documentary directed by Liz Marshall, featuring animal rights photographer Jo-Anne McArthur. Produced by Nina Beveridge and Liz Marshall for documentary. 2015: NOMINEES – Donald Brittain Award for Best Social/Political Documentary, Canadian Screen Awards; Best Direction in a Documentary Program, Canadian Screen Awards; Best Photography in a Documentary Program; Canadian Screen Awards; Best Sound in a Documentary Program, Canadian Screen Awards. 2014: Official Honoree at the 18th Annual Webby Awards in the Best Use Of Interactive Video category for “Online Film & Video”; Shortlist for the International LUSH Prize. 2013: Top Ten Audience Favourite, Hot Docs Film Festival; Best Nature/Environment Golden Sheaf, Yorkton Film Festival; Compassion for Animals to Liz Marshall & Jo-Anne McArthur, Toronto Vegetarian Association; Special Jury Prize – International Competition, DMZ Docs; Best Canadian Feature, Planet in Focus Environmental Film Festival; Green Screen Award, 2nd place, Planet in Focus Environmental Film Festival; Top Twenty Audience Favourite Award, IDFA; Top Transformational Film, Viewers Choice.